I make batches of these muffins for the week ahead, and store as many as I need for the week in a box, and then freeze the rest. 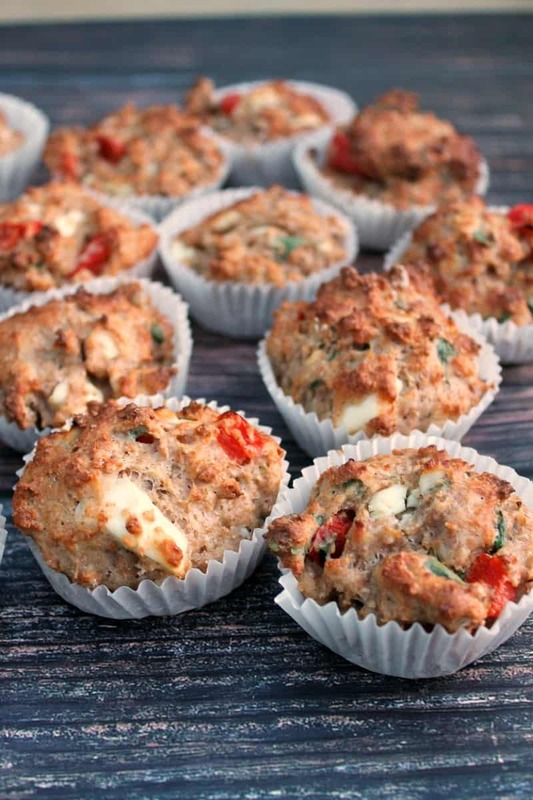 Savoury muffins are great because you can change the fillings depending on what you need to use up. 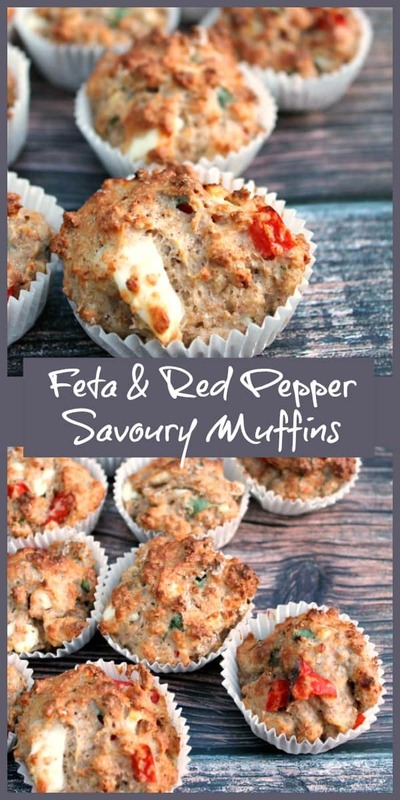 These feta and red pepper muffins are only 2 SmartPoints per muffin on WW Freestyle so you can easily fit them into your daily points allowance either for lunch or for snacks. Using light feta and zero percent fat Greek yoghurt in them keeps the points low. If you aren’t worried about the calories then do use your preferred full fat feta and yoghurt! 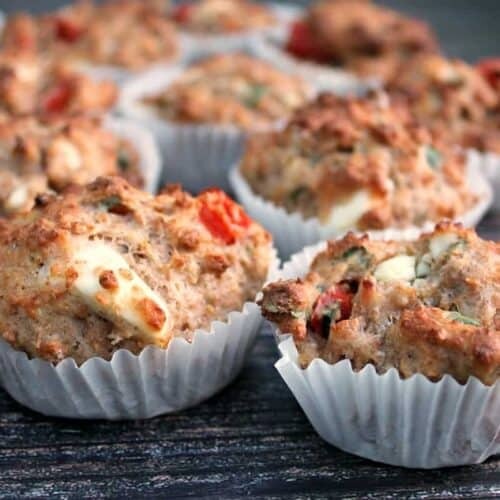 Kids love these savoury muffins too, and they scoff them up here without realising they are really healthy since they are made with wholemeal flour and contain one of their five a day. 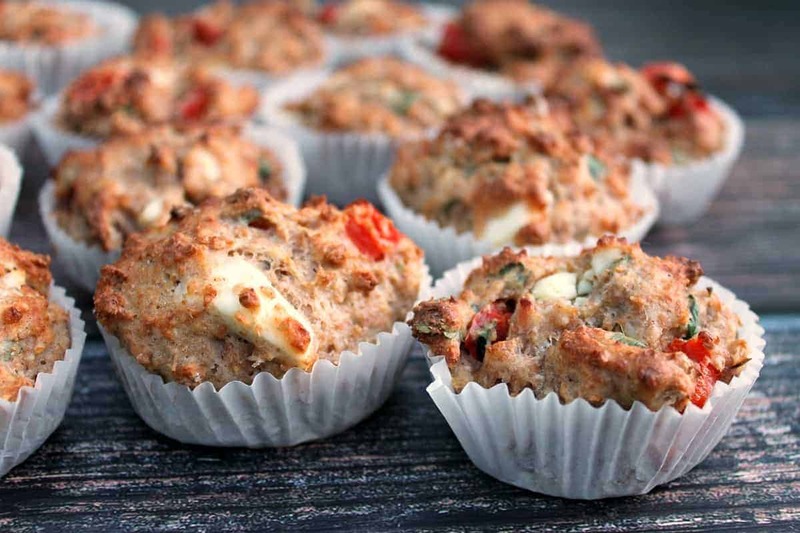 Using herbs for added flavour means there is nothing plain about these little muffins! They are made in small cake cases as in the kind you use for fairy cakes, and the recipe makes 16 of them. If you want to use larger muffin cases then you’ll get about 8 larger muffins. As well as being great to pop in your lunch bag, these muffins would also work well for a picnic or to take on a day out. They are very portable and don’t make too much mess! Inside the chunks of feta cheese and red pepper and green specks from the fresh parsley make them look vibrant and colourful. As is usual with muffins, you make up the dry ingredients in one bowl (flour, baking powder, herbs and fillings), the wet ingredients in another (here I used milk, yoghurt and eggs). Add the wet ingredients to the dry and mix briefly until combined, but don’t overmix. Spoon the mixture into your muffin cases then bake for 15-18 minutes until golden brown and cooked through. Can I Freeze Savoury Muffins? Yes they can be frozen. I usually freeze them in a freezer bag. 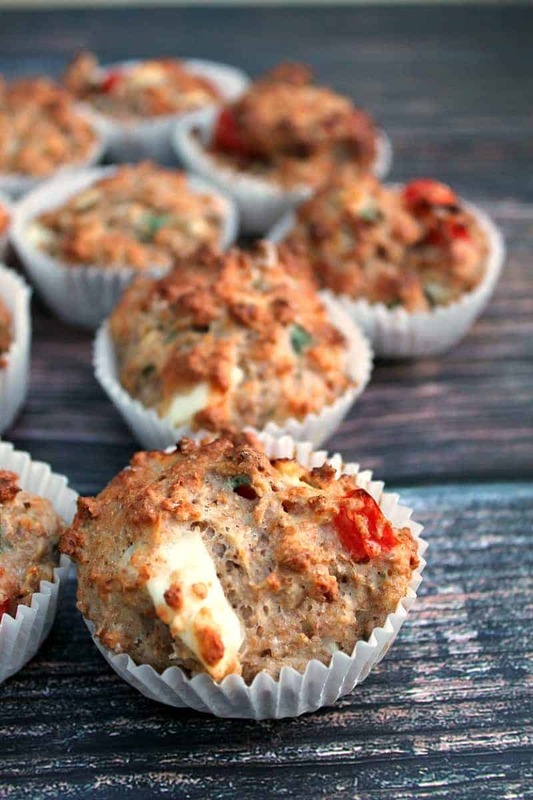 How to Store Savoury Muffins? Keep them in a tupperware box or similar for 2-3 days. It is best not to refrigerate them or they will go very hard. Green pepper, chopped tomato, sweetcorn, spinach, butternut squash chunks, peas, different cheeses, chunks of ham. Put the flour, baking powder, herbs and spices and salt and pepper in a large bowl. Put the Greek yoghurt, eggs and milk in another and whisk together. Add the red pepper, parsley and feta to the bowl of dry ingredients. Pour the wet ingredients into the dry ingredients and mix gently briefly until combined. Don't overmix. Spoon the mixture into 16 small cakes cases in a muffin tray. Bake at 180 degrees (fan) for 15-18 minutes or until golden and cooked through. Remove from the oven and allow to cool slightly, then finish the cooling on a rack. Enjoy either warm or cool, for lunch and snacks. 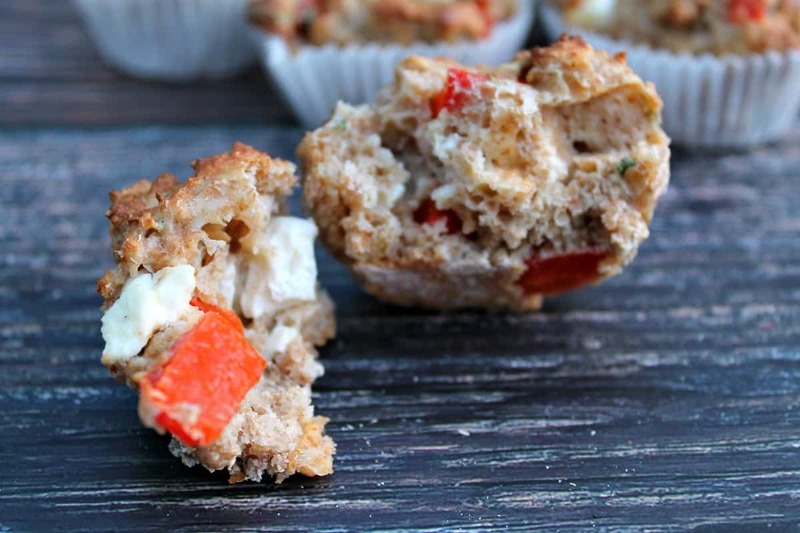 I love savory muffins, they are great with soup! I do like a savoury muffin. Actually I prefer them to sweet ones. They are just brilliant for packed lunches and picnics and yours sound delicious. The pepper gives them a lovely colour too. 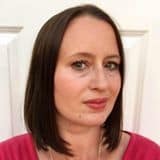 Wow they look lovely Lucy, and great that they are WW friendly too! Delicious. Thanks Kate, great for handy snacks for the kids! The recipe looks great, thank you for sharing it! How many eggs does it use please? I cannot see them listed in the ingredients. Oh yes the eggs have disappeared, I’ll add them back in, it is 2 medium eggs! Thanks for letting me know.